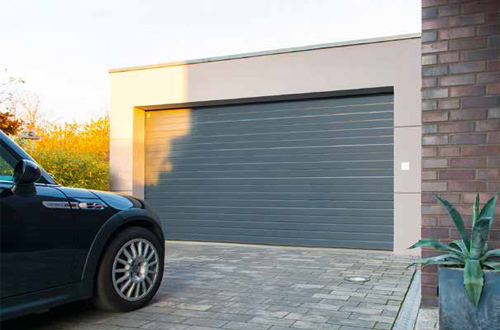 The Carteck GSW40 range consists of sectional garage doors that are manufactured in Germany by Teckentrup to a very high standard and specification. The door is able to combine security, style and safety as standard, along with some unique features that make it the best door solution in many circumstances. 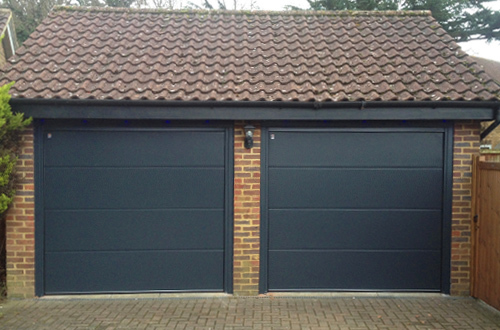 The Carteck GSW40 sectional doors are available in several attractive panel designs – Georgian panelled and Horizontal ribbed being the 2 most popular in the UK - both options are manufactured with 40mm thick, insulated steel panels. Each door panel is finished with a woodgrain texture as a standard feature; this is pressed into the steel material before final finishing.  There is however, also the option of a smooth, stucco or micrograin surface finish on most design options for a very different aesthetic effect to the front face of the door. 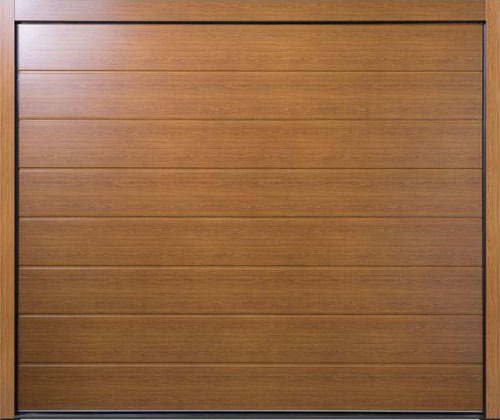 Carteck sectional doors are available in a choice of three finishes – standard paint finish, high grade laminate woodgrain or polymer paint finish, all resulting in a beautiful, low maintenance and durable exterior. Carteck's sectional doors are built to last; they have a two year warranty on all parts and a five year warranty on safe and reliable operation. 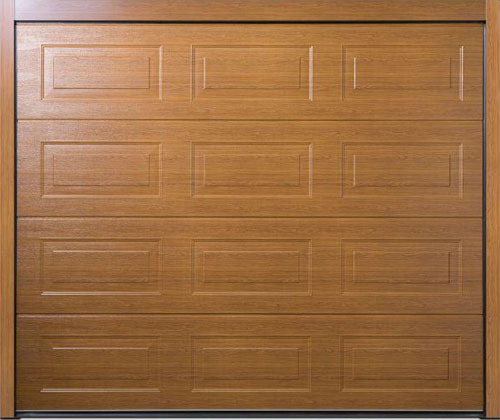 Plus, there's a further ten year warranty given on the exterior finish of the door. 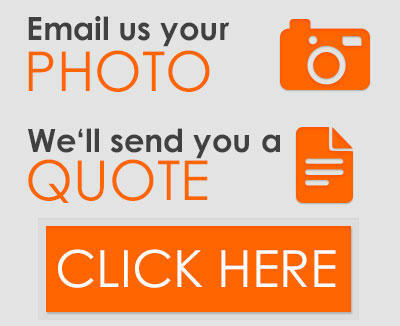 The electric motors offered all have a five year guarantee. 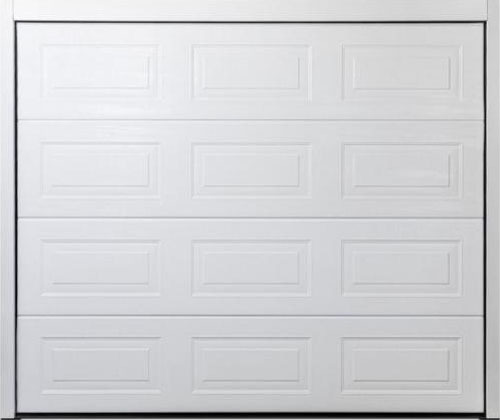 Carteck GSW 40 sectional garage doors offer excellent security as standard with multilatch two point locking and optional bolts on all manually operated doors. 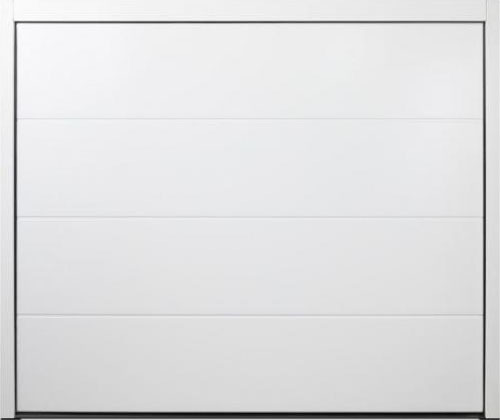 Patented, galvanised, wear resistant hinges make the interlocking door panel sections extra secure, with quadruple folded steel at all hinge fixing points for solid attachment of the hinges to the panel sections. Each door panel section is incredibly strong by its design with double skinned high strength galvanised steel enclosing a rigid layer of environmentally friendly insulating foam in 40mm thick panels. The door when closed is held within the frame and tracks at 10 separate points to ensure a solid, tight fit with no obvious gaps for the opportunist thief to attempt to jemmy. Rubber sealing is standard to the sides and head of the steel frame with a large rubber compression seal affixed to the bottom panel to prevent leaves, dust, rain and the like from entering your garage. 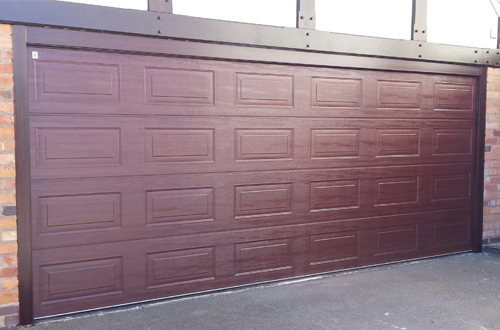 The operation movement of a sectional garage door ensures very good clearance during opening and closing to give maximum use of garage length especially if keeping a large 4 wheel drive vehicle or van with a tall flat rear end. The drive through width and height are also maximised when the door is fully open with an electric operator fitted.  The standard colour most used is white paint finish.  Most powdercoat RAL colours are also available and you will need to specify the exact RAL number when ordering. 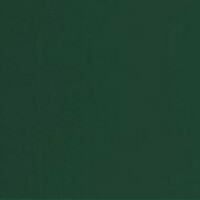 The colours below are 'trend' colours offering excellent value for money as a standard range of optional colours readily available from Germany.  TT9011 is priced as Wood Design door finish and therefore does not qualify as a TREND coloured door.  If the finished colour you require you require is not available as a standard Trend colour, we are able to coat our standard panels to a RAL or BS colour. For doors coloured in this way, doors are made and cut to size from white panels and then sprayed to the required colour. The spraying process is of a very high standard but will not be as uniform as the pre-coated steel of Trend coloured doors. 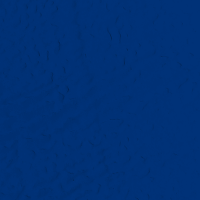 Any variations in sheen or density will, however, be minor and may only be visible at very close proximity or at oblique angles in strongy directional light. Effects of this nature should not be discernible from a distance of 3 metres - a standard set by the DHF (Door & Hardware Federation). The surface finish is low gloss and it is customary to only colour the outer surface of the door, however the inner face can be coated to match as an optional extra. 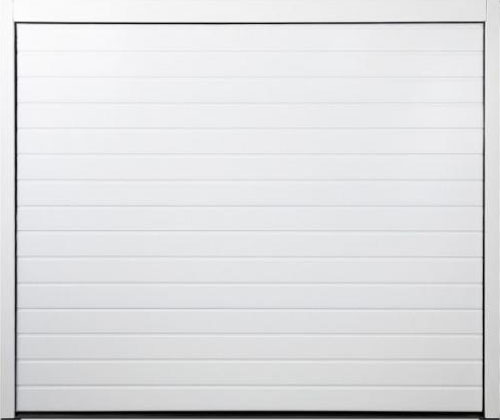 The Carteck sectional door is designed for absolute ease of operation with a unique multiple spring tension system ensuring a very smooth and easy operation at any of the available sizes, large or small. The door also incorporates a host of innovative and protective safety features to make it one of the safest you can buy. Double cables on each side and multiple springing support the door in the unlikely event of spring or cable failure, meaning the door will not drop and can still be opened or closed. The springs are also fully enclosed in trays at high level well out of the way of fingers. 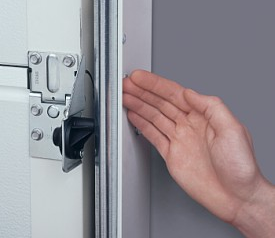 Interior and exterior finger protection also feature as standard on any Carteck sectional door, preventing dangerous narrow openings between panel sections during operation. The springing system means that nearly every size of Carteck door only requires headroom of 115mm and will not need several structural fixings as required for front mounted torsion spring assisted sectional doors. 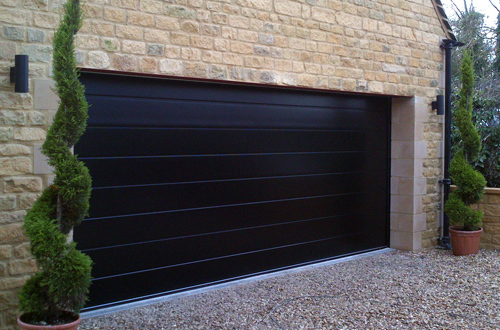 This means the door is ideal for garages with little or no headroom to maximise the drive through height. Having many more standard heights to choose from also means you are more likely to get a door the full height of your opening rather than having to infill above a lower height door. 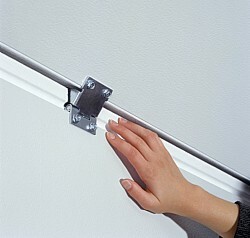 In addition hand protection at the side of the guide rails prevent accidents between the frame and the guide rail from entrapment during operation. All remote control electric versions of the Carteck are recommended to be installed with either the Carteck 260 belt driven operator or Carteck 270 or 280 versions of the operator. All electric operators offer safety reverse if an obstacle is hit in either direction or the optional extra additional infra red beam system to completely inactivate the door if an obstacle is in its path. This is usually for doors likely to be used very frequently or near public paths and highways. 2 hand held radio transmitters are supplied for control as standard with further accessories available such as keypads, keyswitches, timers, finger readers and so on. All access control systems can be tailored to suit the requirements of the household and occupants using the garage with integration into other systems also possible such as electric gatres, awnings, lighting, etc. Extremely scratch-proof new-look glazing elements, wicket doors, TÜV-tested burglar protection, as well as quicker, cost-effective and solar powered drives – Teckentrup has expanded its range of CarTeck garage door products The company showcased all of its innovations in Munich in January. More safety, more convenience, more choice of looks – Teckentrup presented a much further developed garage door range in Munich. Wicket doors, i.e. 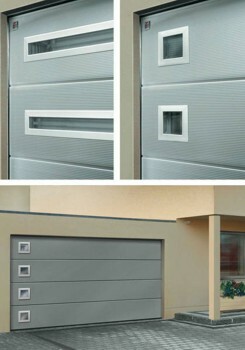 pedestrian doors integrated in the main garage door, allow you to pop into the garage without having to open the main door. This is particularly useful if another entrance is not available. And the main door remains firmly sealed in spite of the wicket door: A threshold provides a continuous bottom edge. The one-piece floor seal runs across the whole width of the door, keeping rain, dirt, leaves, etc. out. The 45 mm threshold is also extremely low; and the door functions perfectly even on steeply inclined driveways, e.g. for garages located underneath properties. Electrically operated doors have a safety contact which ensures that the main door can only be opened when the wicket door is closed. The new extremely scratch-proof glazing elements are available in numerous shapes - from porthole windows to windows with glazing bars. 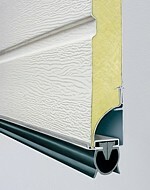 They also allow sunlight to enter your garage and offer highly durable attractive architecture with a unique appeal. The high-quality aluminium frame of Type D and Type E are particularly elegant. Burglar and accident protection are important security and safety features. cigarette lighter transmitterTeckentrup doors are TÜV tested: The independent German test authority confirms the burglar resistance of the electrically operated garage doors. Therefore, all CarTeck doors display the TÜV mark. Furthermore, operational safety is guaranteed by a photo cell which is installed approximately 20 cm above the ground and stops the door as soon as the beam of light is broken. 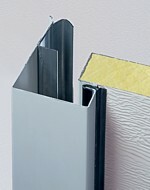 The components are fully protected inside the frame when the garage door is closed. The Teckentrup 5-point guarantee underlines the extreme durability of the doors; guaranteed for more than 10 years for doors with special high-performance springs (CarTeck door GSW 40). The new “speed” drive increases convenience: It can open a door in half the usually required time.  The new CarTeck drive generation “2” reduces energy consumption in stand-by mode by 25% compared to conventional solutions. And the new, flexible energy-saving lamps on the drive allow you to light up your garage perfectly. Drive retrofitting is usually possible. A rechargeable battery operated drive is now also available for garages not connected to the mains. The rechargeable battery can be simply taken indoors and charged overnight. The environmentally friendly alternative: Power supplied from a solar module that can be installed on the garage roof. Even remote control of your garage door is now easier: The new handheld transmitter “D323” plugs straight into your car’s cigarette lighter with no need for batteries, allowing you to open your garage door from the comfort and security of your car.